Given how happy I am with the current cover of The Cthulhu Hack and some general requests on the Elder Sign front, I have experimentally opened a Cthulhu Hack Redbubble shop front for the sale of merchandise. The range of available options. The fact that I have bought things from them before. 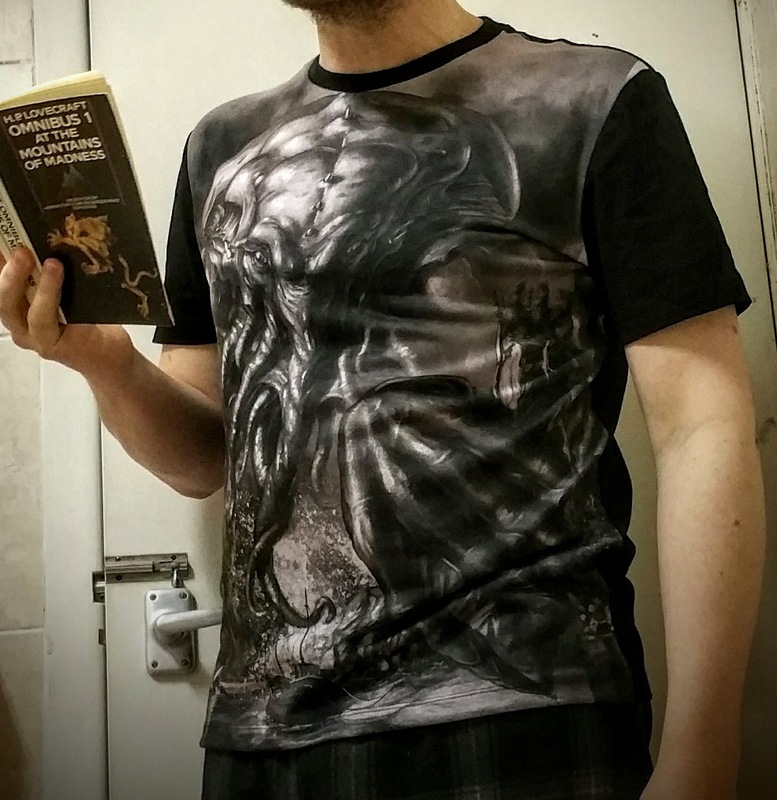 And the availability of a full front panel graphic t-shirt option to make the most of Henning Ludvigsen’s marvellous image of Great Cthulhu. I’m clearly no kind of model – and the best spot for taking this picture was the bathroom, if only for want of a fairly plain backdrop. I wasn’t going to sell something I hadn’t picked up myself. The full panel really does look great, with black sleeves and back panel. It’s a t-shirt and the full graphic printing uses a lightweight fabric, so this is not a heavy or winter-appropriate piece of kit! It would work perfectly well with an appropriate coloured long-sleeve top underneath, or with a nice hoodie over the top. The image came out really well – clean, clear and crisp. If the full graphic panel doesn’t appeal, you can get the Cthulhu Hack in other forms of apparel and merchandise (follow the links and click Available Products to see options). And, you can also get a range of stuff with the Elder Sign – with the option, for apparel, to have the symbol on the front or back, defaulting to the back. That works best for hoodies, for example, but you probably want to change the settings for the front. It’s an experiment. I’ll continue to look into local options for event sales – as in that instance I’d want to secure bulk t-shirt orders – and keep you all informed! In the meantime, look out for offers – like the 20% off everything at Redbubble with the code PERFECT20 available at the moment.